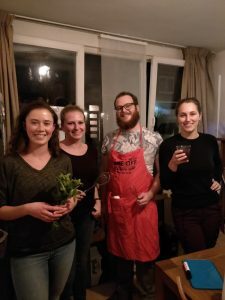 This year G.A.G.’s very own culinary committee consists of Iris, Mira, Judith and Vincent. We will try our very best to show you that there is more to food than the high quality kebab of cafeteria ‘De Fest’ (and that’s a high bar indeed). There will be several dinners along with other culinary activities like the Great Gobblers Bake-off. Our aprons are washed, ironed and ready to hit the kitchen. We hope to share our food with all of you. Let’s be honest; who doesn’t love a multi-course meal for a few euros?